Super fast phone/contact utility gets you connected fast. 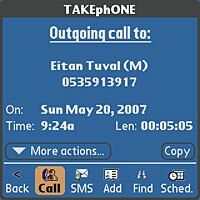 TAKEphONE is a slick utility that turbo-charges the Treo�s contacts/phone applications and provides a lighting-quick way to access your address book and then call, email or SMS listed contacts. Looking up a contact is extremely fast: just type in their initials and all matches will appear onscreen. Start typing in the letters of a first name or second name and matches will dynamically update and become available for clicking as you type. You can even use an "&" search, so that if you�re looking up 80s big hair stadium belter Tina Turner, typing in "T & T" will narrow the results down to all contacts that start with a T for the last name and a T for the first name. It�s very, very fast and we can�t think of anything quicker on any phone - and you�ll certainly leave iPhone users far behind - in fact, the system is so quick we�ve never even bothered to input a lot of our favourites. 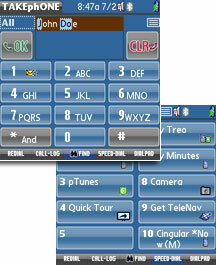 The program supports the Treo�s 5-way jog dial so getting around the screen is easy, and with most of the onscreen controls being large enough for finger operation, you�ll rarely (if ever) need to yank out the stylus to get things done. The attractive interface sports an optional, horizontally scrolling iBar which lets you dial contacts by clicking on their photo. Customised actions can be set for each contact, so that clicking on one photo will immediately call that contact, while another could be set up to call up a dialogue box giving you the choice to directly call, SMS or email the contact. Clicking on a search result takes you to the contact's details and here the program really shows its worth: with one click you can call them, fire off a SMS, send an email from your preferred email client, schedule a meeting, edit their details or even see their address displayed on Google Maps. New contacts and scheduled calls can quickly be added to the Palm address book from the drop down menu, and you can start a Google search from within the program (with the results opening in Blazer, or your chosen web browser). 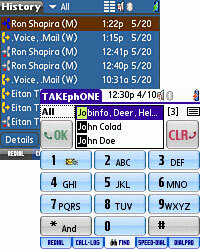 The five tabs at the bottom of the screen give access to the redial list, the 'find' homepage, speed dial, dialpad and a hugely comprehensive call log. This lets you sort entries by 'all', 'incoming', 'missed', 'outgoing' and 'data', and clicking on a contact brings up a screen giving full call details and the option to call or SMS the contact, copy the details, schedule a meeting or add them to your address book. The main screen also displays the time, email and SMS count, signal and battery strength, Bluetooth/GPRS on/off, mute button status, speaker volume and the next upcoming calendar event, with the entire interface fully skinnable. With its ability to set up unique dialling rules for different locations, TAKEphONE should be pretty handy for road warriors too. Although the screengrabs may well undersell the application a bit if you've spent the last week being dazzled by the polished sheen of the iPhone, once you've had a play on TAKEphONE we reckon you might be writing it down on your 'must-have' application list. The program makes searching for contacts extraordinarily fast, and with one-touch options letting you call, text and email contacts in seconds, it's a great program for people with large address books. The interface is also hugely configurable, letting you set up the program to your needs. At around £11, we reckon the program's well worth the outlay and it's already earned a permanent place on our trusty ol'Treo 650. Highly recommended.